Vandorallen Trebatius, an Imperial knight, is the current owner of Rosethorn Hall in Skingrad. He's delinquent on his rent, however, so if you're interested in buying the place he will be evicted and from then on will stay at the Two Sisters Lodge. There is reason to believe he was once an Arena champion, but he has apparently fallen on hard times. Unfortunately, he has no unique dialogue whatsoever, so you won't learn about it from him. Before his eviction, Vandorallen wakes up at 8am in the Top Floor of Rosethorn Hall. He will go to the Two Sisters Lodge for his breakfast at 10am, which he spends two hours eating. 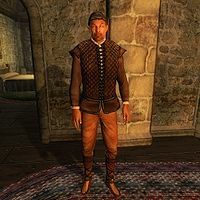 At midday he will trek up to Castle Skingrad, where he will spend six hours wandering around the Main Hall. If he is still the owner of Rosethorn Hall he will wander the ground floor between 6pm and 9pm, before going to the West Weald Inn for a two hour supper. Afterwards he will return home at midnight for another eight hours of sleep. If he is evicted, he will instead go to the Two Sisters Lodge. As he's a member of the local militia, he will spend any free time in the Guard House. He will be found there between 8am and 10am, and when he gets evicted he will spend three hours there instead of relaxing at home at 6pm. He wears a set of middle class clothing consisting of a quilted doublet, tan linens, and a pair of russet felt shoes. He also carries some gold. Vandorallen has the ability to use a leveled set of knight spells. Shum gro-Yarug will mention Vandorallen a couple of times when you talk to him about buying Rosethorn Hall. He will mention who the current owner is when you first ask about buying the house: "I can speak for the Count. Rosethorn Hall is a stately manor currently occupied by Vandorallen Trebatius." After agreeing to buy Rosethorn Hall, Shum gro-Yarug will assure you that Vandorallen will be removed from your new house: "Don't worry about Vandorallen Trebatius. I'll have him evicted. I'm sure he'll find another home easily. Oh, and don't worry, we're tossing all of his junk out as well." Vandorallen never sleeps at the Two Sisters Lodge after his eviction from Rosethorn Hall, because all five available beds were assigned to the vampire hunters faction, even though there are only four of them. This page was last modified on 28 January 2016, at 12:18.